Venture Slips On An Oil Slick! Whoa, what’s with the Venture dropping 32 points or 4% in just 2 days, leading to an unusual March on top of a freaky February? Spring has sprung in most of Canada, but it certainly hasn’t been a pretty couple of days for the Venture which closed below 800 yesterday for the first time since early December. Before we get into one reason WHY this is happening, let’s take a look at the Venture short-term chart for a look at the current behavior of the Index from a technical perspective. There’s reason to believe that some immediate/near-term relief is on the way as RSI(2) and RSI(14) on the daily chart have hit low extremes not seen since the 2017 bottom in July when the Index landed at 748.84. Nearest support is 780 which the Venture came within just 2 points of yesterday before finishing at 784. For weeks we’ve been pointing out key resistance in the low 830’s. A market will take the path of least resistance, so after not being able to push through the 830’s the Index decided to test important support instead. The EMA(8) and EMA(20) are the critical short-term moving averages – they are at 811 and 822, respectively, and in decline. Both EMAs need to be conquered and both must reverse to the upside for confirmation of the start of a fresh uptrend. One significant factor that’s impacting Canadian markets, especially resource stocks, is political in nature: It’s not a partisan comment to say that incompetent left-leaning governments at the provincial and federal levels (Trudeau, Wynne, Notley, Horgan-Weaver) have implemented policies and taken positions that are hurting the resource sector, in particular the Oil and gas industry, and the general economy as a whole. Canada is now trailing the United States, for example, in almost every economic category and the gap is widening (but we’ll “save the planet”, right?). One recent bank report indicated the Canadian economy is losing $50 million a day ($16 billion a year) due to a lack of pipeline capacity. Politicians possessed by gender and “climate change” ideologies (imagine, putting a resource project to a “gender” test!) are destroying investment and jobs right across the country while also putting Canada at a competitive disadvantage vs. our largest trading partner. Justin Trudeau has brought in a National Energy Program that’s just as bad as the one his father introduced more than 3 decades ago, while an ill-conceived federal revamping of the resource project approval process has added new regulatory hurdles for companies. In B.C., the Green Monster is doing everything it can to block the critical Kinder Morgan pipeline expansion while one half of the two-headed Green Monster (Andrew “Wacky” Weaver) has actually come out against the largest proposed investment ($40 billion) for an industrial project in the province’s history – an LNG facility in the northwest part of the province that would generate 10,000 jobs. What sane politician would oppose such a project? Wacky Weaver’s reason is that it would produce 8 to 10 megatonnes of greenhouse gas emissions and the NDP has no “climate plan” to address that. He’s prepared to defeat the NDP on the issue later this year if it doesn’t produce a satisfactory “climate plan” (hopefully he will and B.C. can rid itself of this cancerous Green-NDP coalition). 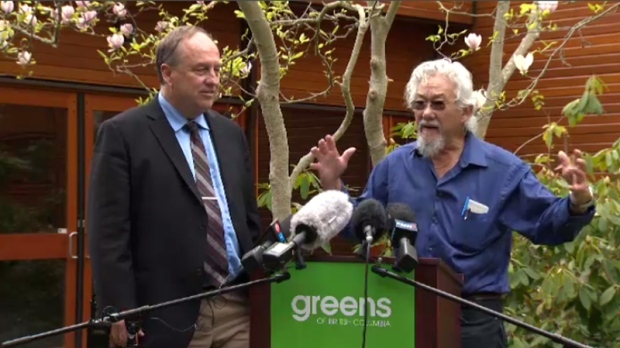 For the first time ever, extremist David Suzuki put his support behind a political party – the Greens in B.C. led by Andrew “Wacky” Weaver. Now the Good News – change is in the air as an election in Ontario in just over 2 months (June 7) is expected to finally put the horrendous Kathleen Wynne government out of its misery and usher in a new period of fiscal sanity and pro-business, pro-resource sector policies. That change, led by populist conservative Doug Ford, should dramatically alter the national discourse and encourage investors in the process. If there’s one company exploring in Canada with an opportunity to breathe new life into the entire junior resource market with the discovery of a generation, it’s Garibaldi Resources (GGI, TSX-V) which will soon be taking aim at a bull’s eye massive sulphide target within the HC-1 conductor on a significant step-out from EL-17–14 – a world class 40.4-m intersection. It’s not just the impressive geophysical signatures that are pointing to massive sulphides in ALL directions from the Discovery zone that was confirmed through drilling late last year, but Dr. Peter Lightfoot has collected an overwhelming amount of geological evidence that supports the case for a robust Nickel-Copper-rich system and a new mine in the heart of a prolific high-grade Gold and Copper-Gold porphyry Camp. The HC-2 conductor, meanwhile, is a pleasant surprise and could lead to exciting new possibilities southwest of last year’s drilling. Based on news late last year, we already know that at least 2 km of prospective ground exists to the east-southeast of the Discovery zone while a northeast trend of geophysical anomalies and surface mineralization continues for a minimum of 6 km. Hang on to every GGI you’ve got because we expect crews will be mobilizing in April for a dramatic restart to drilling that could quickly carry the stock back to last year’s highs. 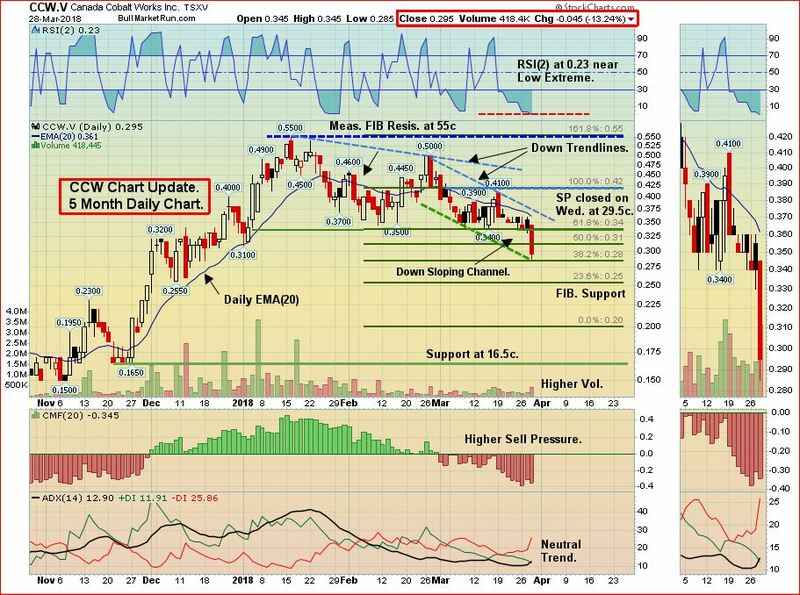 A non-resource stock that’s ideally positioned to zoom to the upside is Pascal Biosciences (PAS, TSX-V) which we’ve been recommending as an astute buy anywhere in the 40’s. You’ll see few charts on the Venture that are as encouraging as this one. PAS broke out forcefully above a downsloping channel last month on record volume with 35 cents being the critical breakout point, coinciding with new Fib. 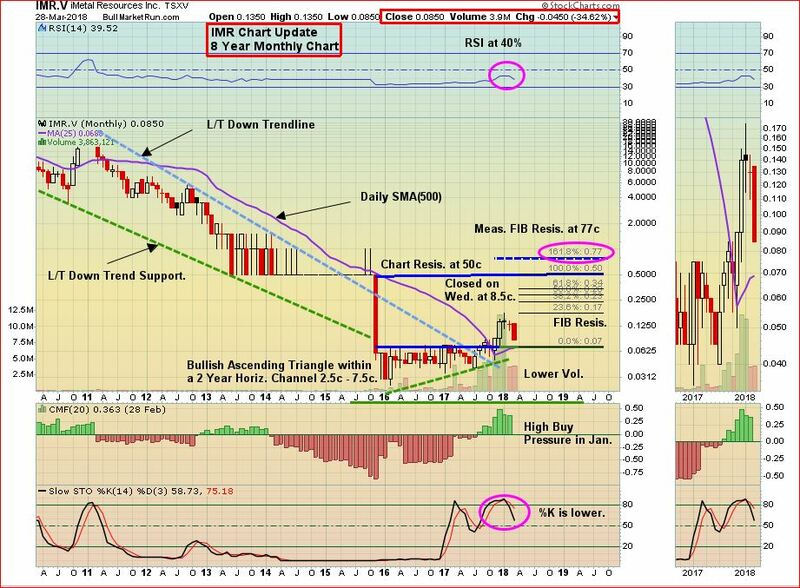 support and the current EMA(50). Our analysis is that this stock is going to enjoy an explosive 2018 with next measured Fib. 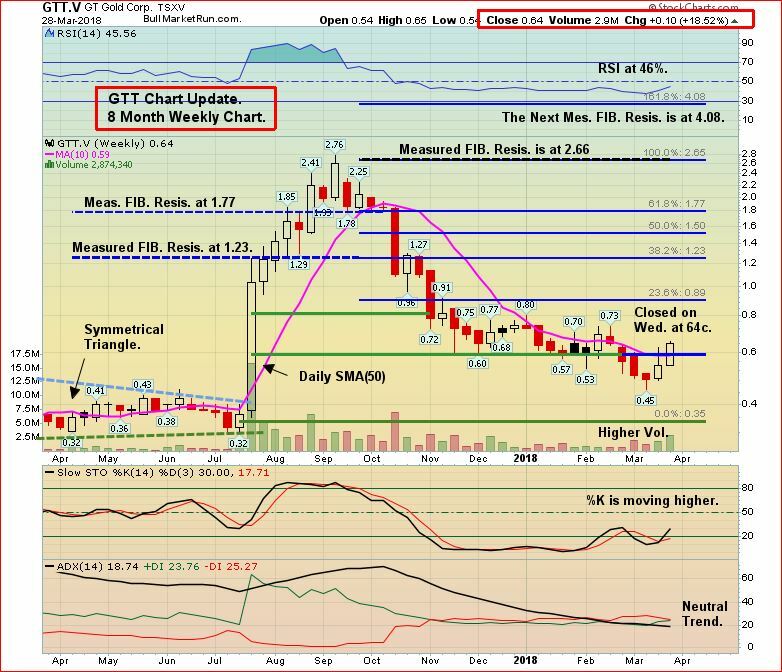 resistance in the $1.20’s – accumulate and hold! No company – we repeat, no company – in the northern Ontario Cobalt Camp is better positioned to produce a Cobalt resource and get product to market than Canada Cobalt (CCW, TSX-V) given its underground access at the Castle mine. President and CEO Frank Basa just needs to hurry up the process to commence underground drilling – Jon just had a meeting with him and we’re confident he’ll execute on that plan. Last year, CCW ran from pennies to a high of 30 cents before losing half its value and briefly trading in the mid-teens where it was an incredible buy. It then more than tripled in just over 2 months to a January high of 55 cents before starting another correction, similar in percentage terms to the one last year. From a fundamental standpoint, CCW remains well below where it should be in relation to its peers. Basa does have to move his feet a little faster – that’s what the market is saying and we believe he understands that message. There will come a point when Gold will suddenly explode to $1,400+ and discovery plays like iMetal Resources (IMR, TSX-V) will rise by orders of magnitude. The election of Doug Ford, a strong proponent of northern Ontario’s resource sector, is also expected to positively impact companies in that region. And here’s something else – iMetal Resources has the full support of both First Nations groups in its area (the Gowganda West Project). The above, combined with an exciting grassroots discovery of high-grade Gold over a broad area of outcrop on a property contiguous to a 4-million ounce Gold deposit, gives us great encouragement that IMR can turn into a multi-bagger win for investors in 2018. Technically, IMR has dropped on low volume toward tremendous new support at the top of the bullish ascending triangle that formed over a 2-year period. GT Gold (GTT, TSX-V) bucked the trend and was up sharply yesterday, closing with a 7-point gain at 64 cents. Subscribers should be accumulating on any weakness with an eye toward holding for the next 4 to 6 months for a minimum move to measured Fib. resistance in the $1.20’s. Just over a week ago the company announced the closing of a $6.5 million private placement above the market at 72 cents per share (no warrants). That’s certainly a vote of confidence in the company’s Tatogga Property in northwest B.C. where an exciting high-grade Gold discovery was made early last summer, propelling the stock to a high of $2.76 where we advised locking in profits. The company’s cash position is now $9.5 million, meaning this summer’s planned program is now fully funded. Technically, it’s safe to assume the stock bottomed out in the mid-40’s last month. Accumulate on any weakness. Next major resistance is 89 cents followed by $1.20’s. Why Are These People Smiling – Their Stock Has Tanked 80%! 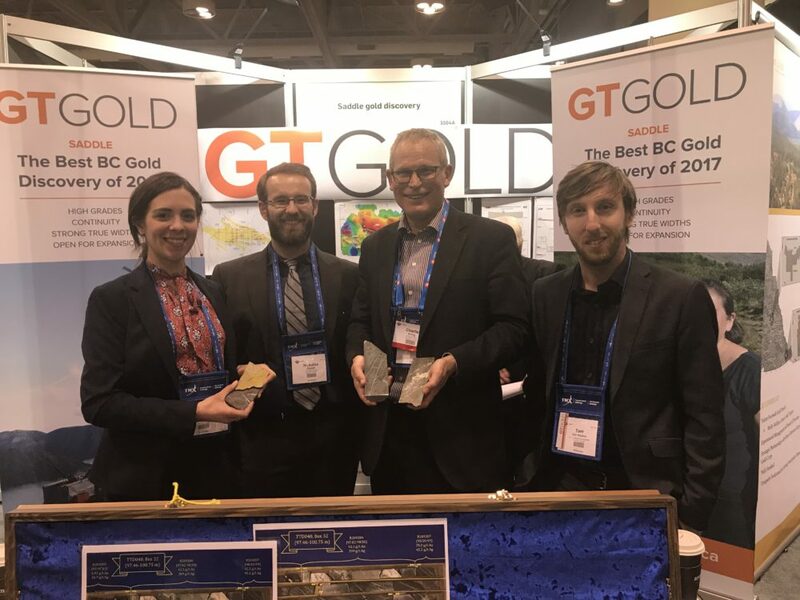 Below is a picture of the GT Gold (GTT, TSX-V) crew at the PDAC “Core Shack” this afternoon. Charlie Greig, one of our favorite geologists, is the second from the right in this picture, holding some highly mineralized drill core in each hand from the company’s Tatogga Property (Saddle South Discovery) in northwest B.C. near Iskut. 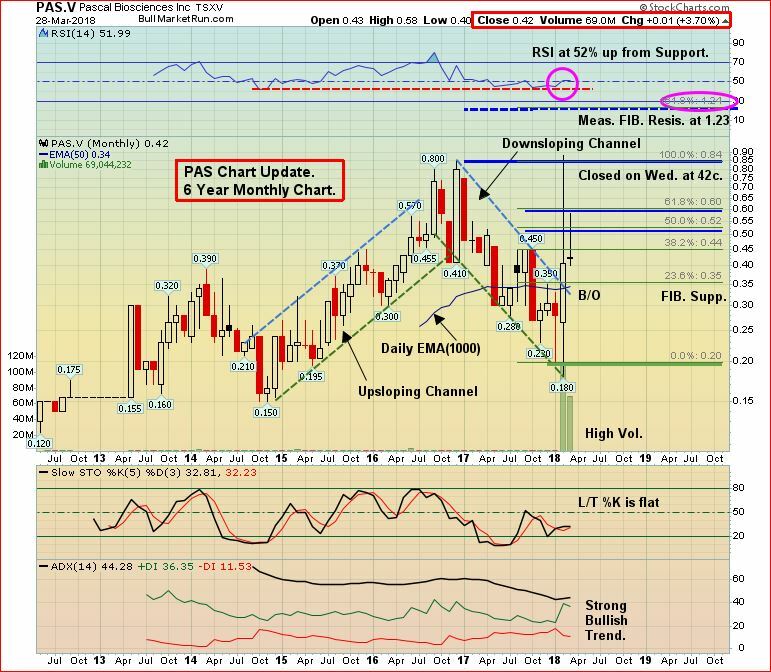 After surging as high as $2.76 last summer (BMR gave a sell recommendation at Fib. resistance at $2.65 after our original buy alert below 40 cents during the first half of the year), GT Gold has fallen 80% to just 55 cents (today’s close). Ouch…but these folks are all smiles! Charlie’s no market wizard (virtually no geologists are) but he does understand how to find Gold, and he has found lots of it at Saddle South – a high-grade epithermal Gold-Silver vein system that was never drilled until last year. GT Gold completed 28 RC holes last summer and 58 diamond drill holes for 16,000 m. Abundant juicy intercepts along 1,000 m of east-west strike to >500 m down-dip from surface were highlighted by 51.5 g/t Au over 6.95 m in hole #7. Meanwhile, a potential Red Chris-style porphyry system has been drilled into at Saddle North. GT Gold is fully financed for this year’s work (about 85 million shares outstanding after the 84-cent flow-through PP closes) and Charlie told Jon this afternoon that the company expects to drill as much as 30,000 m in 2018, starting in June. So this is why Charlie & Co. are smiling – they know they’re onto something big and they’re confident about where things are headed once the drills start turning again. 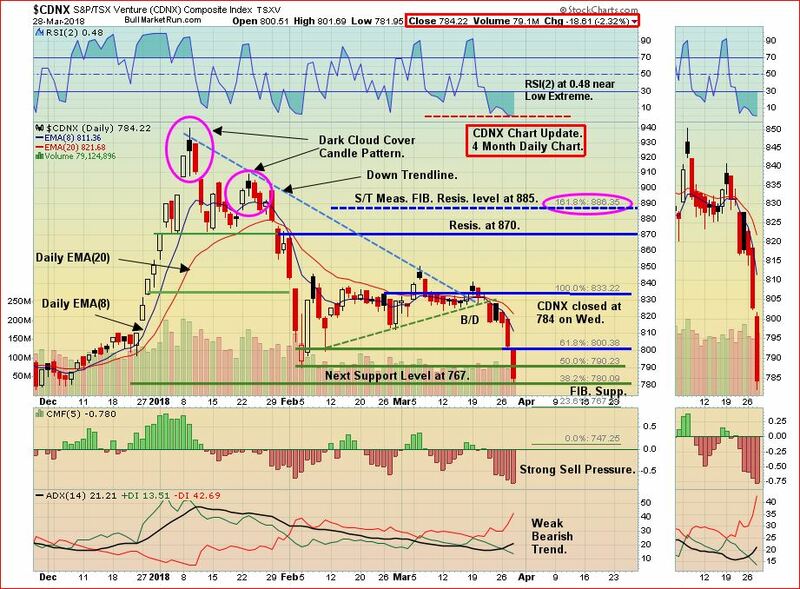 We bring GT Gold to your attention tonight, not because you should buy it tomorrow morning but you should put it on your “watch list” as a strong candidate for at least a double or even a triple from the spring lows to this summer’s high. Note: John, Jon and Dan hold share positions in GGI and CCW. John and Jon hold share positions in IMR. Jon also holds share positions in GTT and PAS. I’m a bit worried about MOON… Seems like it’s loosing strenght and flirting below support. We’ve been expecting good news since a little while. Any thoughts? Great update guys, especially GGI! What discovery has IMR made? Are you referring to the samples? Have they drilled a hole yet? Trying to understand your analysis at this early stage of exploration. Thanks for MOON’s update Jon, really appreciate! OK I think I see what your saying here. Early Stage but very encouraging with what work has been done thus far. Hi Jon, my understanding was that CCW is finalizing a contractor for rehab work. Is he moving slowly on this? My concern is that CCW has very little strength on the marketing side of things – but in all fairness, it’s been a TOUGH market and would probably be best to just confirm the resource first. What do I know though…. Jon, Dan, John, Any update on MLG? Permits in hand yet? Any major interest after assay results? Perhaps an update for the sizzler this weekend? Hi BMR Dan, just curious why you don’t own AIS. They got the pilot plant and chemistry testing complete. I like to hear opposing sides if that’s the case. Polls for Justin drop. Cheering for resources here. Thanks Jon. Makes sense. Hope that didn’t come across wrong. Like to hear opposing sides from solid individuals if that were the case here. Is big bird and flyingthru the same person? Yes. Sometimes I comment from my phone and the name gets changed. I am concerned by some of the price action in our favourite stocks. CLM in particular has a horrible monthly bar for March and unlike GGI it has already made a significant move before any drilling has taken place (presumably based on Dr Lightfoot’s reputation). Was there any other reason for the massive gain other than anticipation?. GGI last year made its big move only after the drilling started which suggests that there will be limited upside once drilling gets started…perhaps not even exceeding it’s all time high? RSI on the monthly is at 60 which is relatively high but it is falling whereas with GGI it was slightly lower and rising when the drilling started.There is also a slight divergence between price and RSI on the monthly chart and volume also expanded on the down month. Do the charts concern you or am I missing something? Thanks. Thanks Jon for the rapid response. I think my concern is largely based on the move that has already taken place without a VTEM or drilling…but I’ll wait and hope for the best. I probably have too large a positiion in this stock so will reduce on the next leg up and redistribute amongst some of the other picks.Enjoy your Easter. Hi Jon, I’ve been doing more DD on AIS. They are going to address the issue of production constraint within the industry, they have very strong connections with the govenrment, historical data on Guayatayoc, imminent drilling with a maiden estimate, world-class team…I feel quite comfortavke with them a long-term hold. Any other opinions or concerns? With a lot of these plays you just have to be patient and let them play out. If they haven’t changed fundamentally then hang tight or buy more. I remember BMR pounding the table with GGI at .14 and I bought a lot. Then it dipped to .075 losing half of my investment on paper. BMR said nothing had changed fundamentally so I bought a whole bunch more. You have to give these plays time…. sometimes a couple years for really big gains. I think a lot of us… myself included, watch them a little too closely. Haha, I should have taken some this past run to 50. When reading that supply for lithium carbonate has more risk than demand, and very few juniors in this space with a proven team can actually PROODUCE this stuff, hard not to get excited about them for the next couple years.